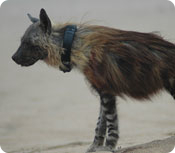 Figure 1: (to the right) Hyena (named "Floggy") with Tellus GPS collar. Brown hyenas are carnivores, which have been intensively studied in the Kalahari ecosystem during the seventies. In contrast to these areas, Namib brown hyenas are top carnivores with hardly any competitive pressure from other carnivores. Therefore this study tries to broaden the knowledge about brown hyenas in an undisturbed, different and unique habitat. The inland areas of the Sperrgebiet distinguish themselves from all other study sites of the BHRP, as there is no concentrated food source such as mainland Cape fur seal colonies nearby and therefore the brown hyenas density is expected to be lower, their home ranges variety of food items and to depend more on density and movement of their prey. We deployed two Tellus GPS collars in March 2005 at the Kaukasib Fountain (Figure 2). One of the collars was fitted to a female of approximately 5 years of age and the other one to an old male of possibly 14 years of age. The collars were programmed to take 144 GPS fixes during the 24 hour period until the middle of August 2005. The VHF signal was transmitted on 7 days a week for 12 hours during the day. We had difficulties locating both brown hyenas during our tracking flights until we expanded our search grit. We finally found the male brown hyena approximately 50 km south of the area, where we had fitted the collar. The female brown hyena is missing up to date, but we still hope to find her before the battery of the collar expires. The remote drop off worked perfectly. We located the hyena from the air and circled around him until we received the recovery signal. The hyena unfortunately did not want to let go of the collar and carried it in its mouth for another 5 km until he dropped it on top of a bush. We recovered the collar on the next day and were able to download more than 14000 data points. Due to the intense programming of the GPS schedule, we could pin-point the location of the active den site (Figure 1: Morgenberg) and were very surprised to find out, that the hyena went on two excursions to the Baker’s Bay seal colony, which is more than 60 km away from his western territory boundary. 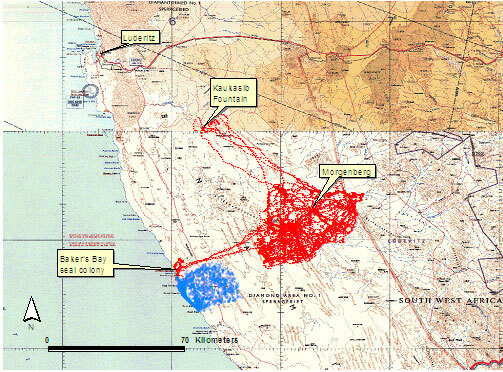 His home range estimate (90% adaptive Kernel) was 1400 km² - a lot larger than the coastal brown hyena’s home ranges of between 100 and 600 km² (Figure 2: see for example GPS positions taken with the GPS-Posrec collar in 2004). (red) for the inland brown hyena. We will fit a total of ten additional Tellus collars on inland brown hyenas and coastal brown hyenas in 2006. We will use the remote download option for these collars and hope to have the first data available by June.